The Trade Association for Information Technology (TAIT) hosted an insightful session for its members on the dynamic world of digital marketing and how it can harnessed effectively by members to grow and expand their business. TAIT focusses on having a pulse on the industry happenings and addresses challenges and roadblocks for members, in a timely manner. With the rising insecurity of the ever expanding online portals like Amazon and Flipkart, who have seemingly offering direct competition to the IT retailers and distributors, the fear of ‘Digital’ as a medium has created quite a scare among these conventional businesses owners. While these business challenges are real, one cannot deny the fast expanding ‘digital first’ ecosystem that has nearly taken over every aspect of modern human lifestyle – from education, banking & finance, business, healthcare and wellness to entertainment, travel and hospitality, it is high time one faces the fears, armed with hard facts and learn key adoption techniques. In line with the above objective, TAIT hosted Manoj Kotak, a passionate and reputed digital marketing expert, who has conducted more than 65 sessions on Digital Marketing for over 3750 attendees all across India. 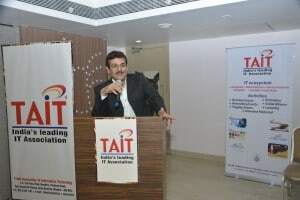 In addition to facilitating technology adoption for masses, Kotak has also represented the Indian IT Industry across 17 countries covering US, Latin America, Europe, Asian Countries & Saudi, as a member of a delegation of India’s largest Electronics and IT trade facilitation organisation that boasts of a consolidated export performance of US$ 200 million by all its members. Viren Bavishi, General Secretary, TAIT, introduced Manoj Kotak to the members and laid the foundation to the conversation, laying the background of key concerns and fears of the members, the answers to which they were seeking from an expert. Through his passionate and simplified style of communication that ensures an easy understanding of the most complex subject, Manoj Kotak took the stage, picking up one topic after the other, transforming the fears and challenges into an adoptable solution. Speaking reassuringly to a hall packed with attentive audiences, Kotak further highlighted how digital is just a new platform for doing business, and took them through the step by step process leading to complete transformation of PUSH to Digital Marketing. He further highlighted the how the traditional way of marketing has eventually converted to digital marketing and how the invent of the mobile revolution has added to the digitisation. Kotak also took members through the nuances of social media management through Google and Facebook advertisement and how these could be leveraged to reach a specified set of target audience, at fraction of traditional marketing cost. From a detailed plan for social and digital media, Kotak highlighted the crux of taming the digital media through simple and effective planning and execution. Other topics addressed during the two hour long session included understanding the ways of digital trading, how to advertise right, and effectively measure the return on investment, so as to effectively generate leads and drive business in the digital world. How to Adopt and Grow your business in the Digital First World 0 out of 5 based on 0 ratings. 0 user reviews.